This is a classic example of trailers being better than the film it represents. I really didn’t like this film much as I thought it was painfully average, but perhaps that is because I was not it’s target audience. Still I didn’t hear any praise from people leaving the cinema or any complaints really. A very boring average. The advice I would give to readers is, don’t pay to go see this at a cinema because it’s not worth the ticket price or your time. Tim’s Film Reviews: wait till rental or TV release. To start off let’s talk about the acting. The acting ranged from good to terrible. The main character of course Snow White (Kristen Stewart) was as always terrible and so bad was her performance, for the majority of the film you just forget it’s about Snow White (it’s like watching a piece of wood floating in the forest, it will disappear!). 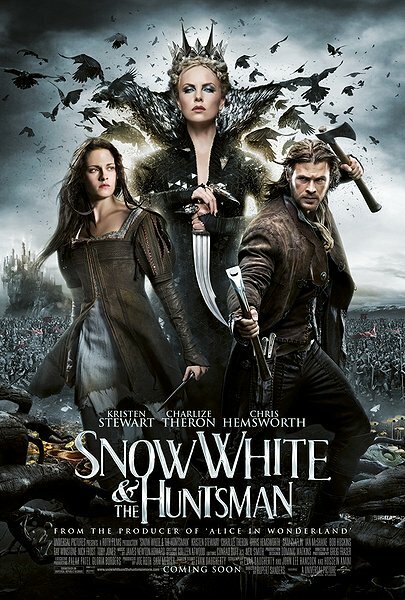 Sadly the Huntsman started off strong but then just felt like Chris Hemsworth gave up on his role half way through, which was disappointing compared to his other roles. He could have had more fun with the role and throw some of his Shakespearean work into the role (would have raised it to 61% easy). Now People who did their acting parts very well or at least thought they would try. Charlize Theron just went with this role and I think her performance is one of the only that I actually remembered in this film, she was the evil Queen. The dwarfs were fun enough and Nick Frost delivered the only line that made me smirk, as they were going through the sewer “look there’s one of mine”. As for the rest of the time it was a poor performance of the seven dwarfs. Think I have moaned enough about the characters now, so let’s talk about something more fun like the visuals. The special effects, physical props and visual landscape shots where actually not bad but very fleeting which considering the 2 hr. 7 min. time frame was disappointing to say the least. The only thought that kept popping into my head when they were walking through the fairy forest was, Edward Cullen leaning on a tree sparkling like the fairies haha. The fighting scenes which seem very cool in the trailer where just as short as in the trailer which is -10%. The plot and script is scattered so that’s another -15%. The comparison between Charlize Theron and Kristen Stewart’s acting ability is essentially good vs. evil so it balances itself out to 0%. The fairest! Really!! She must have used a fairground mirror. The best review I found would be “The story ultimately becomes more Tolkien than Grimm, with extraneous additions and radical reworking’s meant to assuage moviegoers weaned on the Peter Jackson trilogy.” Matt Brunson. This is a good summary of the film really because the whole story was pulled out and made it an hour too long with more effects than new ideas for the very old story that everyone knows. My favourite scene would probably be the last fight scenes but even they were too short compared to the talking and sitting around scenes. I should have followed my instinct and passed on it. I may have been even a bit more harsh in my review. Love your put down of KS acting. Lots of good points here. I agree that the trailers were better than the movie and that Charlize did so well. Kristen Stewart, though annoying, was actually not bad in this film but is no where near being fairer than Charlize. I like the percentage breakdown! Has plenty of style to boot, and evil performance from Theron, but the story lacks the luster of what could have been a pretty impressive epic. I guess they were just following the Snow White story-line which we all know, and sometimes, love. Good review Tim. Theron was one of very few things I liked about this film, thanks for commenting dan. Ahah, I did think of Edward Cullen for a moment there to suddenly mess up with her mind in the dark forest! Unfortunately the scene of her and the prince reminds me of Twilight and that’s NEVER a good thing!! Was that her in panic room? haha didn’t know that, I liked that film. Glad I helped you save money. First time I saw that movie, I thought she was a guy!